Mix 1/2 cup sugar, flour, 1/2 tsp cinnamon and 1/4 cup melted butter in a bowl. Sprinkle over the bottom and edges of a greased 12 inch Dutch oven. Separate biscuits, and cut each into 4 pieces. Mix 3/4 cup sugar and 1 tbsp cinnamon together in a bowl. Pour 1/2 cup melted butter into a separate bowl. Dip each biscuit piece into the melted butter. Roll pieces in the cinnamon-sugar mixture until well coated. 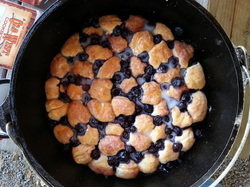 Toss coated biscuit pieces and blueberries together in a bowl. 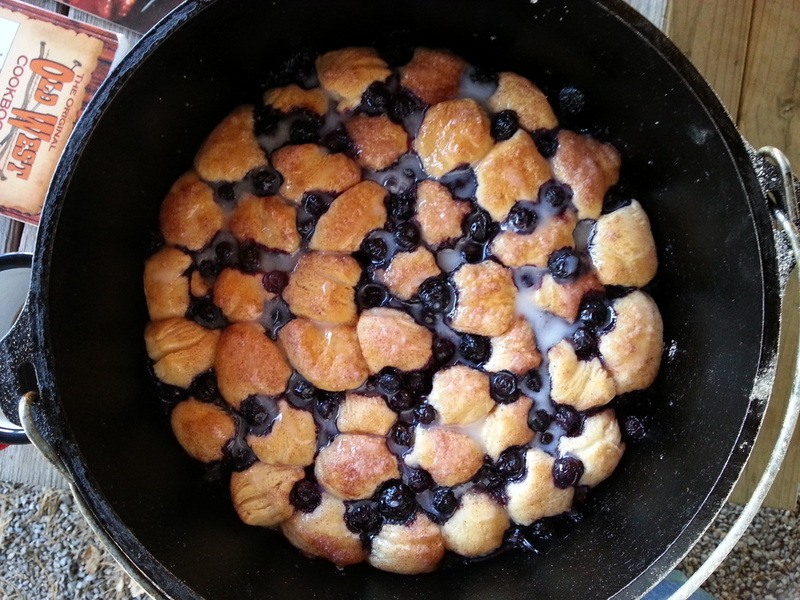 Arrange biscuits and blueberries in the Dutch oven. Drizzle with 1/4 cup melted butter and any remaining butter from dipping. Using 8 coals on bottom and 16 on top, bake at 350 degrees for 20 to 30 minutes. Cool in pan for 5 to 10 minutes inverting on to serving platter. Wisk confectioners sugar and milk together in a bowl until smooth.